The whole idea of sales and selling kind of gets a bad rep, which is a shame because it might just be a couple of bad experiences that have made you want to steer clear of it. I think selling is amazing and I hope my view of it that I’m sharing today will inspire you into action. There are times when selling can feel icky and I’m digging into why this happens. Many people really struggle with this part of the process of growing their business, and it’s a tough one to balance with trying to feel good about it and at the same time managing any mind drama that comes up. Join me as I break down the sell without selling process into three easy sections so you can digest it as you go along. 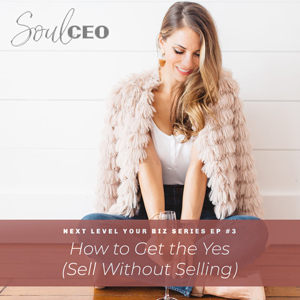 Selling can be so amazing and I know you’re going to be handling all conversations (even objections) like a boss after listening to this episode. If you’re ready to take your business to the next level, visit http://lindseymangocoaching.com/mangomagic to sign up for Mango Magic Academy! What sales means to me. What you are doing if selling feels bad. 3 things that need to happen for somebody to buy from you. How to share your authenticity with your audience. 3 stages of the selling without selling process. How to manage your fear around objections. Grab the worksheet for this episode here! Hello, how are you guys? I am so excited. It is episode number three of the Next Level Your Biz series on my podcast. I am having so much fun and I am loving all of the feedback from you guys. Don’t forget, if you are doing the work, tag me in your Insta story. I love hearing from you guys when you are tuning into my podcast and I want to make sure that I get this in the hands of as many women as humanly possible because I want to help them change their lives and their businesses. So I love it when you guys share it, I love it when you put in on your story. Tag me in it. My Instagram handle is @lindseymango_ and I will continue to share it when you guys post on your story on my story. So, I am ready to jump into day number three, and it is something that I think so many people struggle with and it is sales. But what we’re going to talk about today is what I call selling without selling. So I think selling is amazing. To me, selling is all about giving people the opportunity to buy something that they want, and telling them about it. That’s really how I look at it. So if you have kind of a negative story about what sales is and what it means and all of that, I think that’s really your first part of this work is to like, what’s all the mind drama, what is all the BS that you tell yourself about what sales really is, and get really clear on that and really work on shifting your story around it. I kind of think about how we could say that dogs are bad because I’m sure there’s been a dog out there who has attacked a human. Obviously that has happened, but we don’t say that. We believe – we’re like, dogs are amazing, and then there’s a couple bad apples, and I think sometimes we get really negative stories about sales because we had bad sales experiences and we believe the word “selling” is bad and we have this story. But think about it like a dog. There’s amazing dogs, there’s lots of awesome dogs, and there’s lots of awesome ways to sell in a way that feel really good and feel really exciting. And to me, I think the biggest thing when it comes to selling is what you do before you ever get on a phone call or you ever get on a consult or you ever get into a conversation with somebody. So what I’m going to teach you guys today in your business, no matter what you’re doing, you are selling on some level. If you are offering a product or service, you have to give people the opportunity to buy. So it doesn’t matter what you are doing. If you are offering a product or service or anything, you’re trying to build a business, you have to sell, but it doesn’t have to feel bad. It can be amazing. And you can do it in a way that makes your conversations totally easy and you’re not pushing somebody to buy. So I think the first thing when it comes to selling before I really jump into kind of my process of selling without selling is getting really clear on your intention. Selling feels bad when you are just trying to get someone to buy something that you don’t even care whether they need it or not. That’s when it feels icky, or when you’re pushing somebody or you’re coming from a lack or needy place. So I think the most important thing is first of all, getting really clear on your intention before you get into a sales conversation or you’re creating sales posts or emails or whatever you’re doing. I actually – I just decided just now, I’m going to give you guys a worksheet from my Mango Magic Business Academy that is a selling intention worksheet to help you kind of clear your intention before you get into a sales conversation. Because if you are in there and you’re just trying to push somebody to buy something and your only goal is to get them to buy, it’s not going to feel good. But if you get really clear on your goal in the conversation or whatever it is, an email conversation is to serve them, then you focus on that. And you can still powerfully hold the space for them to make a decision when they’re feeling scared without feeling pushy, and that’s what’s really important about this. So make sure your intention is to serve them but my whole selling without selling process is going to really help you kind of take care of a lot of the things that need to happen before you get in a conversation to make the selling process easy. So I think I’m going to be sending out two worksheets to you guys in the email. So last time I’m probably going to mention this. If you want to get the worksheets, go to lindseymangocoaching.com/ws and you’ll get the selling intention worksheet today as well as a worksheet walking you through the process of selling without selling. So what’s the actual process of selling without selling? So there’s three things that need to happen for somebody to buy from you. One, they have to believe in what you offer. I’ll give you guys an example. So for somebody to invest in coaching, they have to believe that coaching actually works. They have to believe that that’s the way to do it. If they are going to invest in your health program, they have to believe that going to the gym is the way to do it, or they have to believe that eating healthier is the way to do it. So they have to believe in the process, they have to believe in what it is that you’re actually selling. Number two, they have to believe in you being the person to do it for them. They have to believe that you’re the right fit, you’re the right person to help them through that process. Number three, they have to believe in themselves. That’s the kicker. That’s the hard part. I’m going to dig into all three of these things and your additional worksheet is going to help you dig into all these things, but let’s talk about each one. So the first one is they have to believe in the process, or they have to believe in the thing that you are offering. So how do you actually do that? You give them examples. One of my favorite things that my fiancé Chris always says is show, don’t tell. So how can you show somebody that what you offer works? You can show them by telling your own stories. For me, when I first started my coaching business, I talked about every day transformations I made. Oh my god, I realized this thing yesterday and I was listening to a podcast and I noticed I had this really negative thought and I shifted it to this, and oh my gosh, I’m so much happier today. It was true. I was showing this transformation and people could experience it through following me on social media, and that’s kind of how I was getting my message out there. So I was showing them how it was working. I was showing them examples and you can show people that the process works by using your own examples, by using the examples of your clients, by using examples of actually adding value and explaining what it looks like. So it’s kind of like three main things you can do in helping somebody believe in the process. You can show how the process is working for you, you can show how the process is working for clients. If you don’t have clients, showing them how it works for you is the best way to go right there. But when you do have clients or even if you have free clients or a community or you have a conversation and it impacts somebody in some way, you can share that. That’s really powerful. Or, you can actually have them experience it. So that’s where free trainings come in, that’s where a podcast – you guys get value there. For me, early on in my business as I was getting it to six figures and still now, I mean, I use social media to add value. So when someone reads my posts, I’m going in with the intention of helping them transform, like, helping them go, wow, I’ve never looked at it that way. Because then they actually get to experience coaching and they get to see that it actually can help them. So you can do this, like I said, through social media, you can do this through emails, you can do this through conversation. You can do this through, I mean, so many different ways. Video, anything. So use examples, tell stories, share different aspects of it. Use your clients’ examples. Have them experience it themselves. That’s one of the biggest things is having them experience it themselves. Because you guys believe coaching works because you probably listen to my podcast and you probably have taken something away and applied it and gone, oh my gosh, that actually works. That’s why you guys believe coaching and growth works. That’s why you’re here. So whatever you’re offering, make sure that you are constantly showing all the ways that what you offer to the world works. And again, early on, lean on your transformation. It’s okay if you don’t have clients. Talk about how you tried this special healthy way of eating and show your results. Show your transformation. And the big thing about this is especially early on in your business is making sure that you are getting results. So show up for your own work. Make sure you’re applying what you teach other people to your life because that immediately is going to create this big fraud complex, and make sure you’re looking at it from the perspective of I’m getting results because it does get easy to think like, “Am I getting results?” Look for evidence that you are. See it. Really be almost like an inspector in that way. Okay, next piece. They have to believe that you are the person to give it to them. So this is where showing up authentically and being you and sharing your message and sharing the things that you want on your heart and being truthful is really important because you want to make sure that you connect with your right people. And if you try to put this façade on and be something that you’re not, you’re going to attract people based on that. And it doesn’t – I mean, whatever business you’re in. So the first piece is really helping people believe in the process of what it is you offer. The second piece is having them believe and want you to be their person to do it. And so one of the most important things is making sure you’re really authentic in how you share the style of what you do, of how you say you’re a coach. If you focus on one way of doing things, or if you focus on a specific are, make sure you’re talking about that, you’re focusing on that, and make sure you’re sharing the things in your heart that are important to you. Be you. And we’re going to talk about this a little bit later in tomorrow’s episode on branding and marketing, but make sure that you’re just being authentic. Make sure you’re sharing your message in a way that’s like, you want to funnel out the people who don’t fit and you want to funnel in the people who do. Now, I’m not big on kind of doing publicity stunt type things and just trying to wreak havoc and trigger people. I think it’s okay to trigger people by all means, but I think just say what’s true for you, knowing it could trigger people and push them away. But going with the intention of coming from a really loving place, you’re sharing your message, you’re sharing your truth, you’re sharing what you want to offer the world, and knowing that when you’re really authentic and connected to that and you really share your results, your clients’ results, and your process of doing it and your way of doing it and what you believe, you are building confidence in you. So it kind of goes back. I mean, you can kind of do both of these things, belief in your process and belief in you in the selling without selling process just by kind of sharing stories and doing the same thing. So you can do this through social media, you can do it through emails, you can do it through conversations with people. You can give them free content and have them realize you’re the one. Just make sure in this part of the process, you’re being you because I find it’s just like anything else. If I were to pretend to be something else and I were to attract Chris based on that and he fell in love with something that wasn’t actually me and he’s going to be kind of disappointed or caught off guard when I start acting like myself. So just make sure in your business that you’re being you. If you’re a little messy, be messy. That’s okay. If you’re put together, be put together. Know you’re going to attract people based on that and know you don’t need to be anything different or more than what you already are to attract the people you want. When you do that, your business is going to be fun, it’s going to be amazing, you’re going to attract the right people, and that is going to be awesome because you’re going to love who you work with and you’re going to get to be yourself in the process. So those are the first two parts. So now you’re building this trust with your audience, you’re building trust in you, you’re building trust in your process. The next piece is kind of the final layer. They have to believe in themselves. And this is something that can be challenging because that is something that they have to do work on their side. But you can facilitate it. So one of the biggest things when it comes to someone taking the leap and joining a program and joining a mastermind or anything like that is they have to wholeheartedly believe in their capability. And that doesn’t mean that they don’t have doubts. But my job is to help them believe that, is to show up in certainty in what I’m offering, and help them kind of cross that bridge of like, what will it take for you to believe at the next level that you’re going to create this result. Because if they believe in themselves, if they believe in you, and they believe in the process, they are going to be ready and they are going to be amazing because we don’t want people coming into your programs or hiring you or doing whatever when they don’t believe any of that because that’s what they’re going to spend their time thinking about instead of actually getting the transformation or the impact that you’re providing. So how do you help them believe in themselves? Again, you can tell stories. You can give examples, you can show, don’t tell. Use testimonials. That’s also really great for the other two steps of the selling without selling process. But they always think in their mind that they’re different. She’s not like me, or that testimonial isn’t like me, or am I really going to get that? And it’s coming from that lack of belief. So the biggest thing you can do to help people bridge that gap is to actually, in a way, coach them through it, no matter what it is that you are offering. So showing them like, what’s keeping you from believing that you can get the result. And it’s typically going to come in the form of a circumstance or something that they feel like is getting in their way, but it always comes down to belief because if they believed, then they’d jump in and they’d be doing it and they’d be creating the result that they wanted to create. So how do you do this? I said examples, testimonials, showing them all of that, but really helping them identify what is getting in their way of believing in themselves. And maybe that happens in a conversation. That’s why I did consults for so many people when I did one-on-one coaching. That’s why I had one-on-one conversations. I would help them identify, well, what’s keeping you from really believing wholeheartedly you’re going to get results, and when you identify that thought, you can help them say okay, well this is what’s getting and this is getting in the way of many other things of you creating the result that you want. What would you have to believe about yourself or what would you have to think instead for you to create this result, for you to believe wholeheartedly? It doesn’t mean they’re going to snap into it, right? At every level of growth there’s a new level of belief that you have to work on creating. So you can do that through having conversation. You can do it through also explaining how this actually works. So for me, I do this in email a lot. I explain like, what it looks like to not believe and how they can actually believe. So how can you believe? You can look at what’s possible instead of what could go wrong. You can look at all the examples in your life where you have created results. You can look at all the things in your life that have created inner trust. You can practice believing. Like, jumping in and investing in something or taking that leap is a practice of believing. It does feel like you’re jumping off a cliff, and really showing people and telling people that story. So my emails and when I talk to people, I actually walk them through that process. So that’s where they actually get to experience a huge level of kind of transformation and realizing like, oh my gosh, this is coming from a lack of belief, and if I want to work on my belief, I have to take the leap. Now, this might look a little different depending on your industry, but they really have to believe in themselves, they have to believe what they’re going to get from it, and that is the final piece. So you can do that, like I said, by having conversations, by showing them, through free trainings, by actually explaining hey, you might be having this thought. Here is how I help my people get through this thought. You might be thinking that you’re going to get photos from me and you might be afraid that maybe they’re not going to be what I want them to be, maybe I’m not going to look like how I want. So here’s what I do with my clients in my photography sessions to help them feel comfortable, to help them know and trust that they’re going to look amazing, and that’s where my expertise comes in. So really think about these three steps and think about ways that you can consistently put out in the world examples, testimonials, actual experiences where they can get transformations or where they can apply what you’re using or teaching or whatever it is in their life, so that they can really start to learn how to believe in themselves, believe in you, and believe in the process. And then once that’s done, your conversation is going to be simple. I’m sure a lot of you guys have had clients that just signed right up. That’s because they had nailed all three of these. And some of them didn’t, and that’s because one of these wasn’t nailed. And that’s okay, that’s not like, you’ve done anything wrong. I think it’s a part of helping them through that process and then continuing to show up on your end and giving them what they need in order to buy. And this makes selling so simple. Selling is serving. Selling is giving people the opportunity to buy what they really, really want, and giving them examples and showing them – it’s showing them what’s possible. So just be really clear on that. Now, the last piece of this that I want to touch on is this idea of objections. I talk about objections, I think it’s really important when you’re talking to anyone, a potential client, that you don’t show up to that conversation in fear. And so one of the biggest things that I teach my clients is how to manage their own fear around objections. Because if you’re afraid of what they say or you’re afraid of their objection, then you’re going to get scared and you’re going to run away instead of holding the space. I call it holding the space, meaning that you don’t get uncomfortable when they get uncomfortable, meaning that you don’t just back out when they get uncomfortable. Now, I’m not saying at all, when I say handling objections, I don’t use that terminology a lot because I’m not big on playing ping pong match and trying to convince anyone to buy what I have to offer. But I do powerfully hold the space for the client who says, “I really want this, I’m just scared,” and helping them through that. But just know this; the objection that you have the hardest time handling or the objections that show up the most with your clients, they’re happening in your life. Because the reason why you experience fear and you just say, “Well, we’ll talk next week,” instead of really saying, “Okay, tell me more about this. How can I help you through this?” is because somewhere in your life you believe it to be true and when you believe it to be true, then you’re like, oh my gosh, this is real, this is true, they don’t have the money, they don’t have the time, they don’t have the energy, I’m going to back off. Do you see? So I really want you guys to look at the objections or the things that people bring to the table that you experience fear around. I want you to identify where you are having that objection. Where are you wanting to invest at the next level and your mind is like, I don’t have the money, or I’m afraid, or how do I know I’m going to get results. And you actually working through that is going to allow you to understand that it’s just a thought and it’s just a circumstance and if they thought differently about it, then they would create a different result. Because if you guys all were guaranteed a magic wand that would create the result you wanted in your life and it was like $50,000 and I said it was going to take you 60 hours but if you showed up every day and did these 60 hours, you would have the multi six-figure business that you wanted, would you find a way to pay the $50,000? Of course. I’m talking like, this is guaranteed. So any objection that comes up in the process is something that you have the opportunity to work through, to grow to the next level, and then your job is to not let that objection dictate your life anymore and not let it dictate your actions. Once you do that, then you’re going to be able to hold the space for anyone’s objection. You’re not going to run away in fear of like, walking them through their own worry or fear about it. And that’s what’s powerful is to make sure that when you are talking to somebody and you’re having a sales conversation, consult, or whatever you want to call it, that you just ask for permission like, are you open to discussing this? Is there anything I can do to help? Because there’s a difference between someone saying, “I really want this in my heart, I just feel really scared or I feel really unsure,” versus someone just being like, “Nope, not an option. I’m not doing it.” That person’s not there yet. They’re not open to looking at it differently. So just know, handling objections isn’t about selling anybody. It’s just about not letting your fear take over the conversation and you run away. Your job is to be the one who holds the space for them no matter what it is that you offer. And just know that whatever objection you have trouble handing, I really want you to identify what it is and look at where you allow it to dictate your life, where you allow it to hold you back. Your work is to work through that. You guys are going to be freaking killer salespeople. I’m excited for you to work through the worksheet on this. But I wanted to offer you guys one thing before I go. I have a next level mastermind, and this is something that I’m being really selective in the most amazing way of the women who are joining it. This is for the woman who is ready to go big, who is ready to jump into the next level. And when I say that, we’re going to get into this later on in the series, there’s going to be discomfort. It’s going to stretch you. But this is for the woman who’s not here to do this small. She’s ready to take her business to a whole ‘nother level. She’s ready to show up at a whole new level. And I am going to walk all of these women over the next six months through the process of doubling their business, of learning how to leverage themselves, of learning when to outsource things, what actions they need to be taking, managing their mind and believing at the next level. All of the things. My next level mastermind ladies get all access to me. They get one one-on-one coaching call a month, they get a 60-minute strategy session. You get my eyes in your business, understanding exactly what’s going on right now, and we’re going to talk about exactly how you’re going to double your business. It’s going to be a video chat. You get access to this group of amazing women who are all growing to the next level. You can voice message me, text me in this group message whenever you need. I mean, you are getting it all. I am committed to giving you everything to help you get the result. But the reality is that your job is to believe at the next level. You have to believe that you’re capable of creating it. And I can help you through that process but I want to offer you guys that opportunity. So if you are intrigued, if you are interested, if you want all of the details, this is really for the woman who maybe is at like, $50,000 in her business and wants to take it to $100,000 or is even at $100,000 and wants to take it to multiple six figures. I want to make sure that you love your business. We’re not just going to build this business to get you results. Some of you guys already have results. You want to love your life and your business in the process and that’s what this mastermind is all about. So go to lindseymangocoaching.com/nextlevel for all the information. There is an application process and after that, based on the feedback you give me and your answers to the application, then I’ll touch base on whether it’s a right fit or not and we can have a conversation. You can ask all your questions. So I love you guys, I cannot wait to talk to you tomorrow for episode number four of this series. Let’s do this, and I can’t wait to talk to some of you ladies who are ready to take this to the next level. I’ll talk to you soon. Bye.